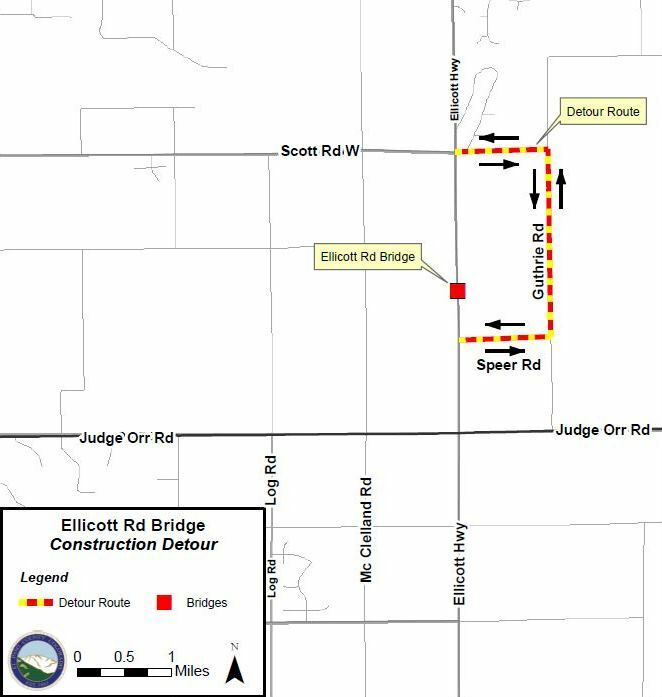 El Paso County Public Works will be doing bridge deck replacement work along Ellicott Highway between Scott Road and Speer Road starting in April 30, 2018. Weather permitting, the project is expected to take about 12 weeks. Motorists are encouraged to use Scott, Guthrie and Speer Roads as detours during construction. These gravel routes through neighborhoods require drivers to travel at low speeds. Those using the alternate routes should plan for added travel time. Drivers are reminded to reduce speeds and to watch for workers, equipment, signs and barricades. El Paso County road maintenance crews wish to thank drivers in advance for their cooperation. The full road closure will accelerate the safe and efficient completion of this project. Funding is provided through the El Paso County Road and Bridge fund.